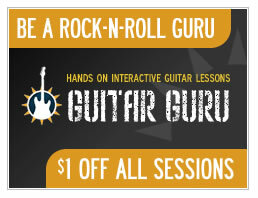 Think you’re well on your way to becoming a rock-n-roll guru? While the Guitar Guru Session for Stairway to Heaven remains our most popular Session, we’ve got a few surprises for you in our catalog that will challenge even the most experienced guitarist. The nice thing about our Guitar Guru Sessions, is that you can choose songs to challenge yourself and your guitar playing skills. If you want to get better at playing the guitar, you’ll want to find songs that are more difficult than what you can master right now. For example, if you can play the “Advanced” Sessions that we offer, you might want to check out these Guru picks we’ve dubbed “Guitar God” for all you gurus out there. These songs are guaranteed to qualify you as a “Guitar Guru.” Don’t forget, you get the tab along with the session so you can play these songs long after you learn them, too! Check back with us on Tuesday, May 26th for a new Green Day session and few other surprises. Remember, our $1 off every Guru Session sale ends at midnight on May 31st, 2009 so don’t be afraid to grab an extra Session or two while the price is right. If you’ve got a song you want to learn how to play, you can suggest a Guitar Guru Session to us, too. Till next time, hope you’re having fun learning guitar! Hey, love this blog. Keep up the great work. Where’s the Green Day session by the way? We added the Guitar Guru Session for Know Your Enemy, which is a brand new song from their 21st Century Breakdown album. Hope you enjoy the Session! Gonna check it out now! Yeah, I’m absolutely sure that if you dream about to became a professional rock-n-roll guru, without any doubts, you’ll become him. You even don’t any apps or booking some tutorial and so on. If you have some special inspiration and desire – you’ll achieve your goal with in spite of everything. A good guitar you can choose here: https://uae.feesheh.com/ . And that’s how I was started to play on my first electro guitar when I was a kid – I totally had no clue how even hold a right way my little cutie. Likewise, when I started to play we haven’t such many web resources which can you support you for free. Living nowadays so amazing opportunity… you even can’t imagine, kids!!! So…When I started I was so blind and without any experience, but anyway I tried to do my best, and step by step, through a fingers pain I became a professional guitar’s players. Nothing but time and inspiration you need.